The Clyde Sharp farm near Roll, Arizona consists of 2500 acres, 30% of which is planted to lettuce and the remainder in diverse crops such as alfalfa, cotton, wheat, and onion seed. The soil on the Sharp farm is predominately sandy loam. The area receives an average of 2.5 inches of rainfall per year. There are two main river basins in the area: the Colorado, and the Gila where the Sharp farm is located. Mr. Sharp uses level basin irrigation for his crops. Level basins require precise water control (including minimal rain), large on-flow rates, uniform soil within a basin, and precision leveled fields. When engineered correctly water can be applied uniformly in a short amount of time. Getting water on and off the fields fast avoids water logging of sensitive crops such as alfalfa. Cotton is less sensitive to water logging, but like alfalfa can suffer root damage when soil oxygen levels are depleted during summer’s high temperatures. The size of the level basins depends on the amount of sand in the soil profile; the sandier the soil the smaller the basin. The water flow into a level basin is between 22-24 cubic feet per second. This configuration allows for a large 20 acre basin to be irrigated in approximately 2.5 hours compared to a smaller basin which takes approximately one hour to irrigate. Water runs are short, less than 1200 feet in this area, to provide rapid and uniform watering which results in high application efficiencies – often greater than 90% for these precision leveled basins. This is an efficiency that successfully competes with any irrigation application system available today. Mr. Sharp works his cotton production into the overall production of lettuce, his dominant crop. In some years the cotton has to be pre-irrigated to obtain a stand, or dry planted and watered up in other years depending on moisture conditions. Mr. Sharp tries to plant the cotton by the first week in March and pick during the first week in September. He also uses a Rood machine, when necessary, to harvest additional cotton that has fallen to the ground. He has found varietal differences in heat tolerance and selects based on this characteristic. This is particularly critical if the cotton is planted late (after the first week in March). 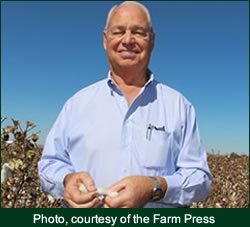 Mr. Sharp emphasizes that cotton should be at or near maturity before the first week in August due to the development of extremely hot, humid weather conditions starting in early July that can impact yield. This level of heat halts boll set at that time. Older bolls are less impacted and speed on to maturity. Despite cotton being a drought and heat tolerant plant, high yields require moderate plant temperatures (ALWAYS below 90°F at night except during boll opening). In the dry desert air, cotton can be 15°F cooler than air temperature if well watered so frequent irrigation is critical to keep the crop moist and thus cool. However, when conditions are hot and humid, even well watered cotton is not much cooler than air temperature. High temperature also decreases yield by reducing photosynthetic gain during the daily cycle but the most dramatic impact is on seed set and thus boll retention. Cotton growers who experience high temperatures commonly see the damage in open blooms; pollen sacks remain smooth during the day and fail to release the pollen, plus the stalks holding the pollen are often short allowing the central stigma to protrude beyond the pollen. When the bolls open growers usually observe small, misshapen bolls with low seed count. Some of the heat damage is invisible to the eye, poor pollen germination and growth as a tube after landing on the stigma. 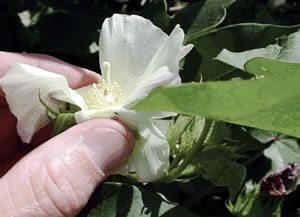 Clyde’s three best strategies to beat the heat include early planting, keeping the cotton well-watered, and getting it safely through bloom prior to mid-July. Additional in-depth information on the impact of temperature on cotton production in Arizona can be obtained from Arizona Cooperative Extension Bulletin No. AZ1448 “Cotton Heat Stress” and for a broader perspective in The Cotton Foundation book “Stress Physiology in Cotton”.